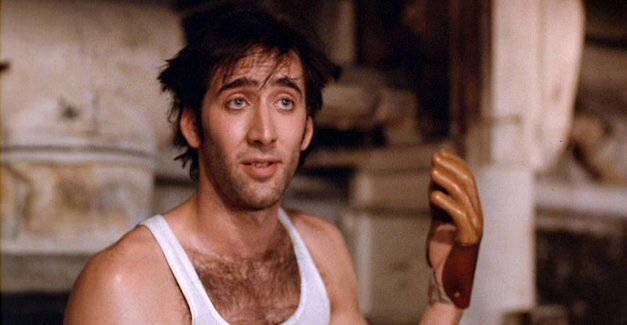 Wait… Nicolas Cage can act? I did not enjoy Being John Malkovich (you can read all about that here). It tried some things and it failed at most of those things. I kept waiting for it to recover, but it never did. Let me sum up Moonstruck for you: Cher (character name Loretta) is in a restaurant. She gets proposed to by Danny Aiello (Johnny). They get engaged, but he leaves to tend to his dying mother in Italia. Loretta/Cher is tasked with asking Johnny/Aiello’s brother, Nicolas Cage‘s Ronny, to attend their wedding. You guessed it. Loretta and Ronny fall in love. I completely bought Loretta and Ronny. The scene they have together in his apartment is so predictable, but in a sweet, funny, and comfortable way. And it was interesting how Johnny left before we got to know him too well. We end up liking Ronny more that way. Being John Malkovich doesn’t really get character interactions right. John Malkovich is very funny with everybody, but the rest of the characters feel like they’re holding something back. It made me very uneasy. Moonstruck, on the other hand, is light and happy. Moonstruck makes the darker comedy funny. Being John Malkovich makes it seem like the writers were on drugs while they wrote it. And not happy drugs. Bad drugs. Shoot yourself in the face drugs. It’s not that I only like happy movies, but Moonstruck has this joyful attitude, even in the face of adversity. I really liked the Cappomaggis. At the end of the movie, all the characters and storylines converged at once at the breakfast table. At first, it felt a little forced and convenient, but then the humor began, and I really enjoyed it. If you see and enjoy Moonstruck, you might also want to check out Bringing Up Baby and Up. Next time: another 70s poll! I agree completely with your take on “Malkovich”–it was THEIR bad trip and they went and made it all contagious. Haha exactly! Thanks for commenting. Very enjoyable post. I feel very close to Moonstruck because it has a special meaning for me. Thanks. It was a fun movie to watch and actually very funny. I’m still surprised though on how Cher got an Oscar for this. It just doesn’t seem like anything really mind-blowing but I guess there wasn’t much competition that year. Nice review. She was very good in it. Cage and Dukakis were also special. One of my all-time favorites! (Probably the only movie for which I will applaud Nicholas Cage…) Great review!